I wanted to like Among the Sleep more than I did, although in fairness I may have wanted to like it to an unreasonable extent. The idea of a first-person horror game experienced from the perspective of a two-year-old was almost too intriguing for its own good, to the point that being merely decent came off as a bit of a letdown. But I did enjoy it, and I'm really looking forward to the DLC that's coming next week. The new content will expand on the story told in the original game, and looks like it will head off to some new locations as well. Beyond that, developer Krillbite isn't saying much, but these things are sometimes best when you don't know what's coming. It's also free, which is a pretty big plus. 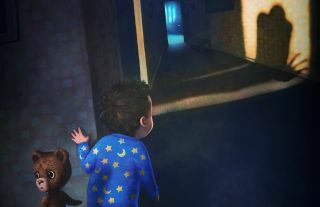 The Among the Sleep free DLC comes out on November 5. To find out more about the game, hit up Krillbite.com.